Add this Salted Caramel Reese’s Popcorn to your movie night plans. 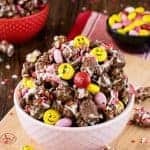 Two kinds of Reese’s candy and a sprinkling of sea salt creates a sweet and salty treat that will disappear in a hurry. I suggest making a double batch. Try this S’mores Popcorn for a fun treat this summer. Perfect way to get your chocolate and marshmallow fix without the work of a fire. Recently we joined a new gym. I thought I was in shape from working out and lifting weights in our garage gym. Apparently when you work out alone, you don’t push yourself as much because I was dying the first week. The weight days have been fine. My muscles are pretty strong from keeping up with my 5×5 lifts, but my cardio is totally lacking. I was gasping and breathing so hard on the first couple of cardio days. Who am I kidding? I’m still struggling. But the plan is to keep going and to keep toning my dessert loving body and to eat more lean and green meals. I would much rather be munching on things like Salted Caramel Chocolate Sugar Cookie Bars and Banana Chocolate Chip Cheesecakes instead of being so dedicated to clean eating, but then my shorts and jeans get mad at me. All things in moderation, right? A little dessert and a lot of greens and workouts keep me going strong! One of my favorite things to make and eat is chocolate covered popcorn. An easy treat that can be made and eaten in 15 minutes flat is the best! Sweet snack mixes are my nemesis though. Once I start, I can’t stop, so I should probably start making smaller batches. 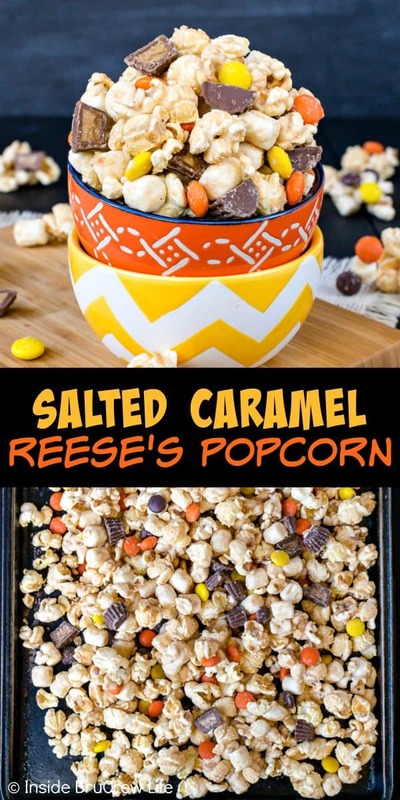 This Salted Caramel Reese’s Popcorn is my newest favorite flavor combo for popcorn. Sweet and salty desserts always disappear in a hurry around me. I just love it so much. If you aren’t as much of a fan, leave the sea salt off. 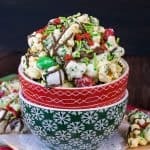 We have a large stand popcorn maker that we use, but a whirly pop popcorn maker or even microwave popcorn all work just as well when you are making popcorn to snack on. Recently we discovered mushroom popcorn seeds at a local candy and popcorn store here in Florida. Did you know that there are two types of popcorn seeds? The difference in butterfly popcorn and mushroom popcorn is the shape of the kernel. Mushroom seeds pop up round and compact with an even surface. They have more surface for different coatings to stick to. 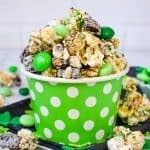 This makes mushroom popcorn perfect for caramel corn, kettle corn, or chocolate covered popcorn. Since the shape is more compact it can hold up to heavier coatings. Butterfly popcorn pops up in unpredictable shapes with wings that stick out in different directions. It’s the most common popcorn that you find in movie theaters. Butter and seasoning easily stick to the popcorn wings. Heavier coatings such as chocolate and caramel will tend to make this popcorn crumble easier. Line a large sheet pan with parchment or foil. 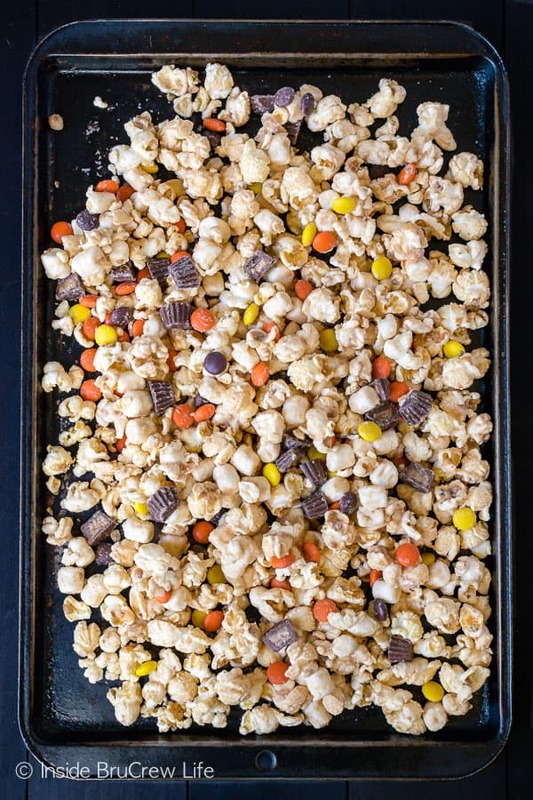 You just want to keep your chocolate covered popcorn from sticking to the pan. Plus, then clean up is very minimal. Pop a batch of popcorn using your favorite method. Any popcorn will work, but keep in mind that the mushroom popcorn holds up better to coatings. Stir together the popcorn and marshmallows. Melt the caramel chips and coconut oil in the microwave in short increments. Do not overheat it because it can scorch easily. Drizzle the melted caramel over the popcorn. Stir until everything has been evenly coated. Pour the popcorn mixture out onto the prepared pan. Sprinkle it with some of the Reese’s Pieces, Reese’s Peanut Butter Cups, and sea salt. Gently move the popcorn around to mix it in slightly. Place the remainder of the candy on top and sprinkle with a little more sea salt. Be sure to use a coarse ground sea salt. You should be able to see the flakes of salt easily. If you use a fine ground salt, it will end up being too salty. Please do not do that because then the popcorn will not taste very good. Place the pan in the refrigerator for about 5 minutes. Remove and break the popcorn into chunks. Store it in a tightly sealed container. 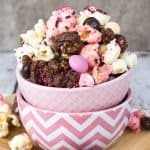 This easy Neapolitan Popcorn is loaded with strawberry, chocolate, and vanilla chocolate and candies. 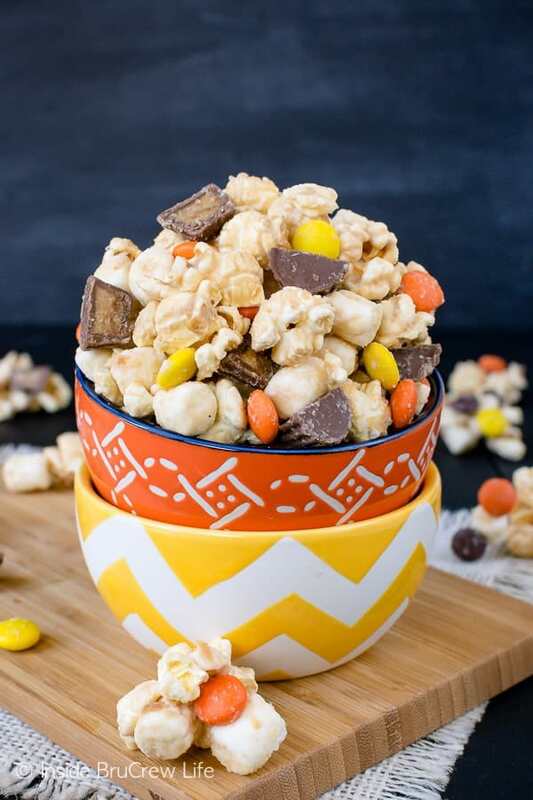 Crushed candy bars and cookies make this Butterfinger Cookies and Cream Popcorn a delicious snack mix. 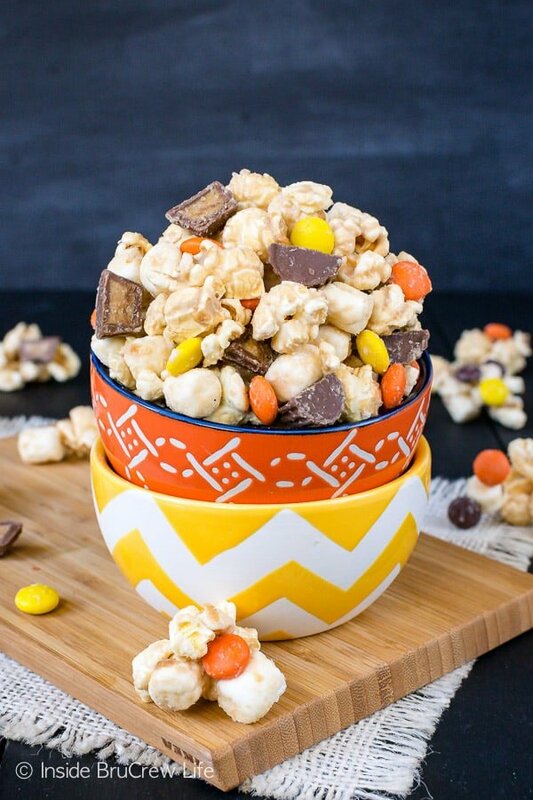 Three kinds of peanut butter goodness makes this Reese’s Popcorn an unforgettable snack mix. 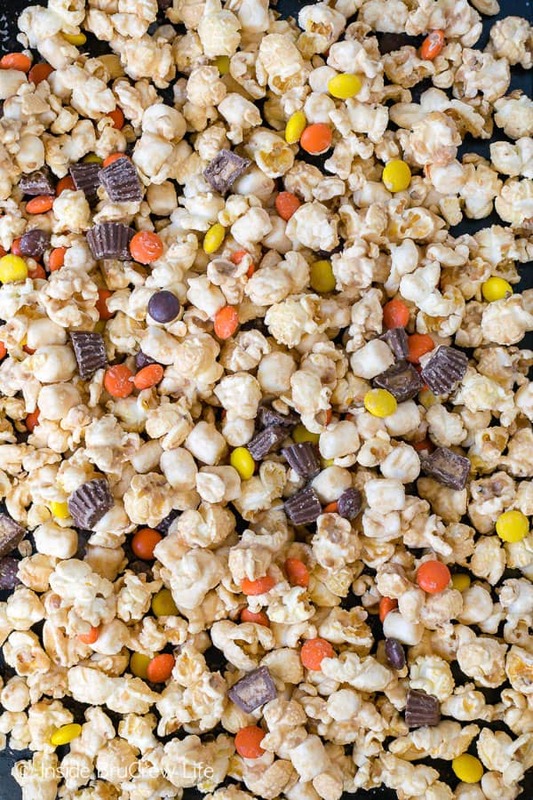 This Muddy Buddy Popcorn has a sweet mix of peanut butter and chocolate. 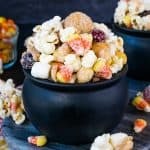 Peanut Butter Popcorn is just what the peanut butter lover in your life needs. 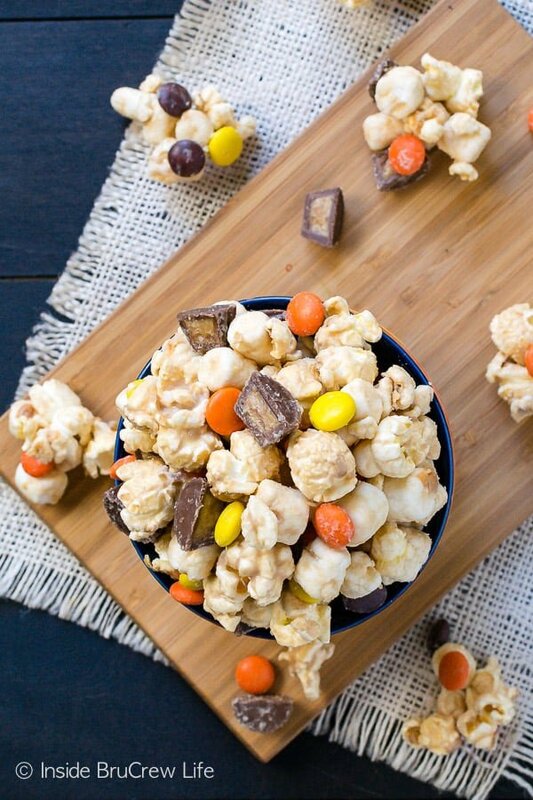 Add this Salted Caramel Reese's Popcorn to your movie night plans. 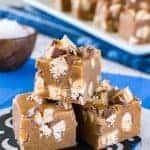 Two kinds of Reese's candy and a sprinkling of sea salt creates a sweet and salty treat that will disappear in a hurry. Dump the popcorn onto the prepared pan. Sprinkle with half of the candies and sea salt. Gently toss and move the mixture around. Add the remaining candies and sea salt to the top. Place the pan in the refrigerator for 5 minutes. Remove and break into chunks. Store in a tightly sealed container. Just curious – would you find salted caramel chips by the chocolate chips? I’ve never heard of them. Thanks.